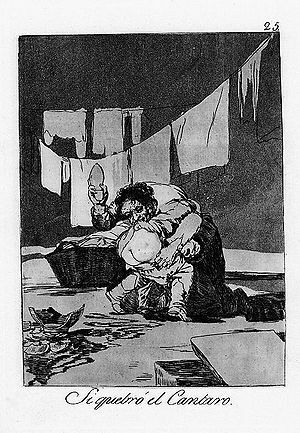 Se quebró el Cántaro, aquatint drypoint etching by Francisco Goya. 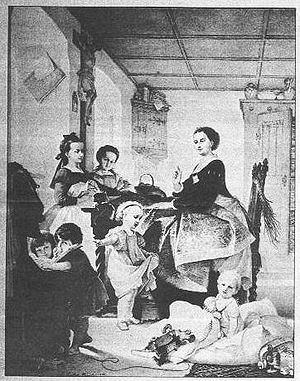 A mother with six children. Historic etching by an unknown artist. Etching is an intaglio method of printmaking in which the image is incised into the surface of a metal plate using an acid. The acid eats the metal, leaving behind roughened areas, or if the surface exposed to the acid is very narrow, burning a line into the plate. The process is believed to have been invented by Daniel Hopfer (circa 1470-1536) of Augsburg, Germany, who decorated armour in this way, and applied the method to printmaking. Most typically, the surface of the plate is covered in a hard, waxy ground that resists acid. The printmaker then scratches through the ground with a sharp point, exposing lines of metal that are attacked by the acid. Once the drawing in the ground is finished, the plate is submerged in acid for a period of time; longer submersion means that deeper lines are etched. The ground may be removed, or the artist may continue drawing in it, etching it again in acid to deepen existing lines while adding new lines. The ground may also be reapplied to protect existing lines while adding new ones. The ground may be removed and the plate printed to see its current printing state, to be followed by more work (or other techniques, such as aquatint, drypoint, or engraving). The etching technique allowed finer details, up to quasi-greyscale, than to any other artistic printmaking technique. For this reason, etching was very popular from the 16th to 19th century to reproduce drawings in high quality, either for framing or for book illustration. This page uses content from Wikipedia. The original article was at Etching. The list of authors can be seen in the page history. As with Spanking Art, the text of Wikipedia is available under a copyleft license, the Creative Commons Attribution Sharealike license. This page was last edited on 16 July 2006, at 20:22.